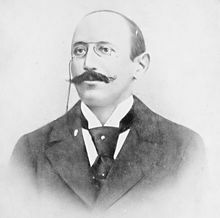 The Dreyfus affair (French: l'affaire Dreyfus, pronounced [la.fɛʁ dʁɛ.fys]) wis a poleetical scandal that frae its beginnin in 1894 dividit Fraunce till it wis finally resolved in 1906. The affair is eften seen as a modren an universal seembol o injuistice, an remains ane o the maist strikin examples o a complex miscairiage o juistice, whaur a major role wis played bi the press an public opinion. The scandal began in December 1894, wi the traison conviction o Caiptain Alfred Dreyfus, a young French artillery officer o Alsatian an Jewish strynd. Sentenced tae life imprisonment for allegedly communicatin French militar secrets tae the German Embassy in Paris, Dreyfus wis imprisoned on Devil's Island in French Guiana, whaur he spent nearly five years. Evidence came tae licht in 1896—primarily throu an investigation instigatit bi Georges Picquart, heid o coonter-espionage—identifyin a French Airmy major named Ferdinand Walsin Esterhazy as the real culprit. Efter heich-rankin militar officials suppressed the new evidence, a militar coort unanimously acquittit Esterhazy efter a trial lastin anly twa days. The Airmy then accused Dreyfus o addeetional charges based on falsified documents. Wird o the militar coort's framin o Dreyfus an o an attemptit cover-up began tae spread, chiefly owin tae J'accuse, a vehement open letter published in a Paris newspaper in Januar 1898 bi famed writer Émile Zola. Activists put pressur on the govrenment tae reopen the case. In 1899, Dreyfus wis returned tae France for anither trial. The intense poleetical an judicial scandal that ensued dividit French society atween those wha supportit Dreyfus (nou cried "dreyfusards"), sic as Sarah Bernhardt, Anatole France, Henri Poincaré an Georges Clemenceau, an those wha condemned him (the anti-dreyfusards), sic as Édouard Drumont, the director an publisher o the antisemitic newspaper La Libre Parole. The new trial resultit in anither conviction an a 10-year sentence but Dreyfus wis gien a pardon an set free. Eventually aw the accusations against Dreyfus war demonstratit tae be baseless. In 1906 Dreyfus wis exoneratit an reinstated as a major in the French Airmy. He served during the whole o Warld War I endin his service wi the rank o lieutenant-colonel. He died in 1935. The Affair frae 1894 tae 1906 dividit France deeply an lastinly intae twa opposin camps: the pro-Airmy, maistly Catholic "anti-Dreyfusards" an the anticlerical, pro-republican Dreyfusards. It embittered French politics an encooraged radicalisation. The conviction wis a miscairiage o juistice based upon faulty espionage an blatant antisemitism, as well as a hatred o the German Empire follaein its annexation o Alsace an pairt o Lorraine in 1871. ↑ Guy Canivet, first Preses o the Supreme Coort, Justice from the Dreyfus Affair, p. 15. ↑ See an aa the speech (in French) o the French Meenister o Juistice Pascal Clement, 12 Juin 2006. This page wis last eeditit on 13 August 2017, at 03:18.